Looking for fabulous favours that won’t cost the earth? We’ve put together our top 10 DIY wedding favour ideas which can be tailored to suit every big day budget. Unleash your imagination and personalise your gifts to create a talking point amongst your guests or choose a pretty keepsake to fit in with your wedding theme. Whether you’re giving a souvenir to be enjoyed on the day, something special to keep or favour tips for brides on a limited budget, get creative, get crafty with our do-it-yourself ideas for wedding favours your special guests will treasure as a reminder of your special day. Music plays a vital role at any wedding so why not save your favourite tunes for your guests. Those treasured memories can then be replayed and guests can relive the happy memories of you gliding down the aisle and their first glimpse of your bridal gown, your first dance and even chosen tracks from your evening’s entertainment. To save costs, burn your own CDs and personalise the covers with special photos of you and details of the wedding date and venue. You could even record the wedding speeches and relive those funny anecdotes for years to come. Love, wish, happy, forever – the list is endless. Scrabble letters can be purchased relatively cheaply in bulk online and you can then make up your own words for guests. Keep to four letter words if your budget is small or personalise the words for individual’s and make them smile on your special day. Words can be wrapped in cellophane or, if your budget, allows purchase small tins to keep them safe. Small magnets could also be stuck to the back of each letter and your guest’s will have a fridge magnet to remember you by! The list of edible delights to add to a jar is infinite. If you are a whizz in the kitchen this can be a cheap and fun way of providing your guests with a token of your appreciation. Mini jam jars can be purchased online and can be filled with mini cheesecakes, jam, marmalade, hand-made chocolates or mini cupcakes. Print your own personalised labels with a message of thanks from the Bride and Groom and tie the top of the jar with a little ribbon as a finishing touch. The contents of the jar can even be linked to your wedding theme or opt for ribbon in the same colour as your decor – perfect if you’re looking for coordinating wedding favour ideas. Especially apt for a Summer Wedding, seasonal fruit can be purchased relatively cheaply and make the most delicious, mouth-watering wedding favours. For added savings pick your own and then fill small paper bags with strawberries, raspberries or cherries and add a little personalised label with a thank you message. Guests could also be given a tissue wrapped individual piece of fruit such as a pear, peach or passion fruit. Tie the colouring of the tissue paper into your wedding theme and add a humorous label such as “We make the Perfect Pear!” A wonderful and colourful budget saving wedding favour which can be as simple or as elaborate as your budget allows. Pinwheels can be as funky or understated as you wish. Available to buy in ready to make kits, there is an array or colours and designs to choose from. You can even buy your own card and make your own by following details available from online craft websites. With such a wide choice of colour and pattern ideas, you are sure to find a design to suit your wedding theme and you could even add a little handwritten personalised message to each of your pinwheel’s which are sure to bring added appreciation from your honoured guests. Individually wrapped cookies can make perfect budget friendly homemade wedding favours. Shapes and colours can be chosen depending on your wedding theme and personalised messages such as your names, the wedding date or a simply thank you can be added for your guests. If baking is not your forte, ask a close friend or relative if they will bake the cookies for you. You can then help to wrap and add a little decorative ribbon. Small cellophane bags can be purchased cheaply online and your gift can then be kept fresh under it is ready to be enjoyed. 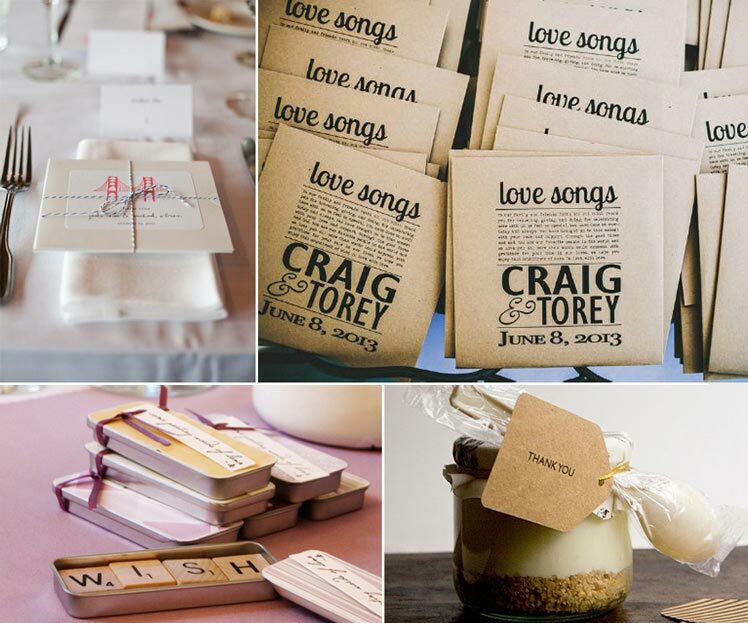 Seeds, bulbs, plants or saplings are fabulous DIY wedding favours. You can buy large packets of seeds such as Forget-Me-Nots or Nigella (Love in a Mist) and split them into smaller envelopes or packets. Peronalised rubber ink stamps can be purchased online and the packets could then be personalised with your wedding details or a little thank you message. If you are a budding gardener, maybe you could grow some little cuttings and pot them up into pretty little pots for your guests. Opt for flowers in the same shades as your wedding colour scheme such as the same hue as your bridesmaid dresses or wedding accessories. Alternatively, if your budget allows you could purchase tree saplings which your friends and family could plant and be reminded of your Special Day for years to come. A perfect momento of your Special Day has to be the Perfect Match. 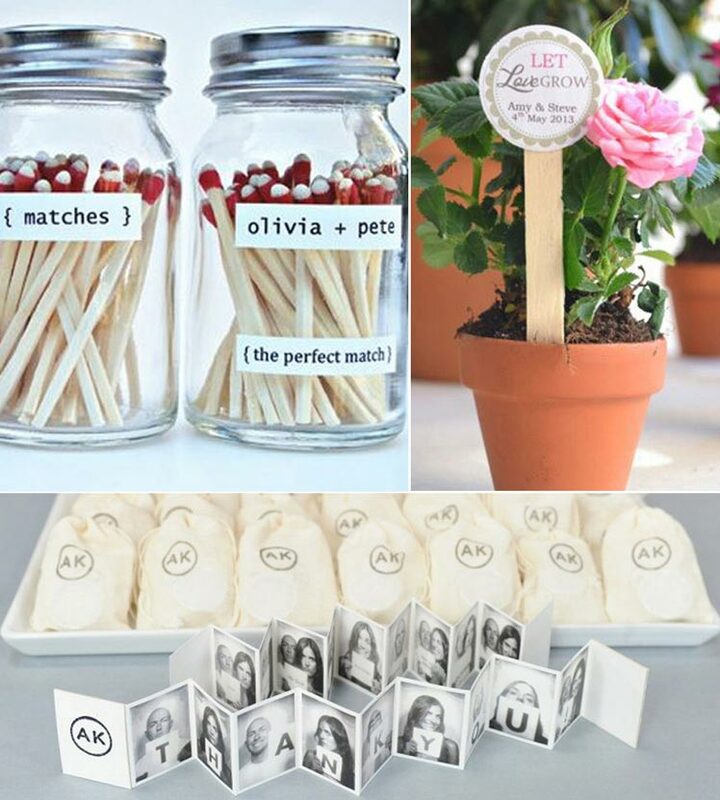 As a budget friendly option, fill miniature jars with matches and attach a Perfect Match label with your names and wedding date. Custom matchboxes can also be ordered online relatively cheaply in various colours to fit in with your theme and you can add your own personal details and messages to the packaging. A wedding favour which will ensure that each time your guests use a match, memories of your glorious wedding day will be reignited! If you’re looking for ideas for wedding favours with the personal touch, what could be better than photographs?! A miniature photo book is a fabulous way of giving your guests a special reminder of your bid day which they can treasure for years to come. Printing costs will vary depending on the style you choose. There are many online websites where you can upload images and create your own designs and you can adapt your choices according to your budget. Unleash your photographic talents and personalise your images with funny or romantic shots. You could even have photos where you and your partner hold up messages of thanks. A truly individual, personal favour which your guests are sure to love. 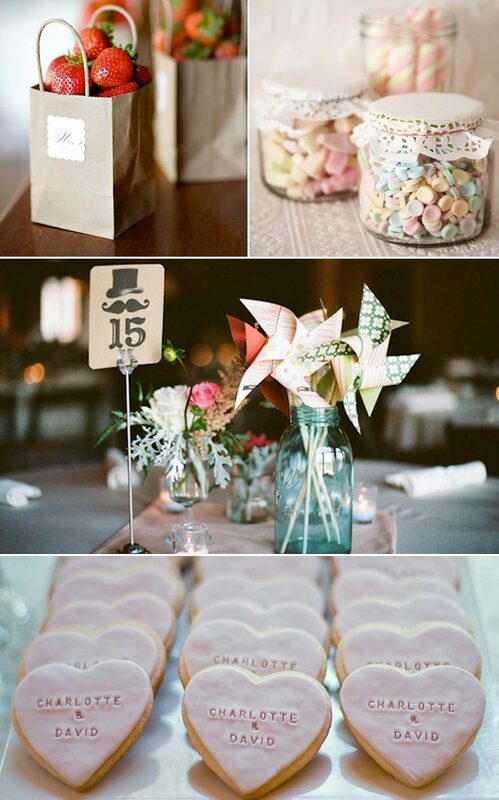 Sweets are a fabulous option for colourful DIY wedding favours. With numerous possibilities there is sure to be an option to suit your budget and your wedding theme. The most economical option is to buy your sweets in bulk from wholesalers or a cash and carry and split them into personalised boxes, bags or tie them together in a pretty piece of fabric or handkerchief. Shop around markets or online for fabric remnants which coordinate with your wedding theme and add hand-written personalised tags with off cuts of ribbon.